The best luscious and tangy Keto Lemon Bars, with coconut flour shortbread crust (tree nut free!). 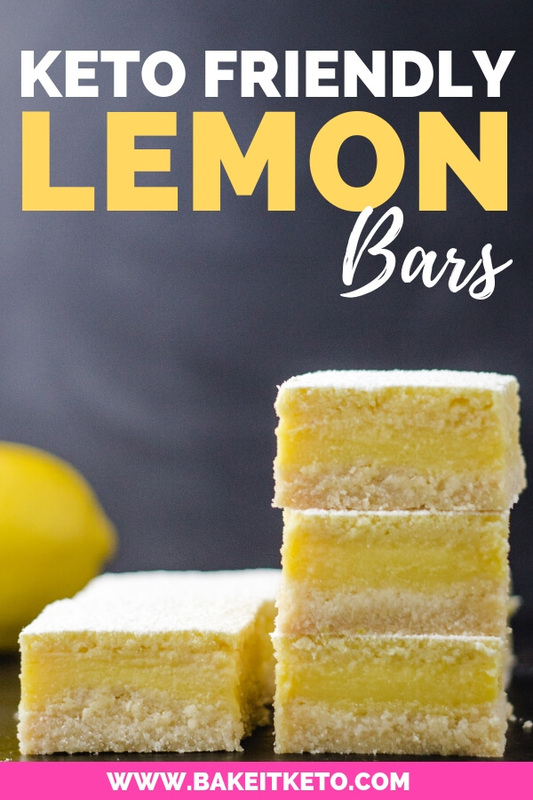 These low carb lemon bars are easy, sugar free, and delicious! Everyone in our house just adores lemon. Do you love lemon too? Then you’re in the right place! 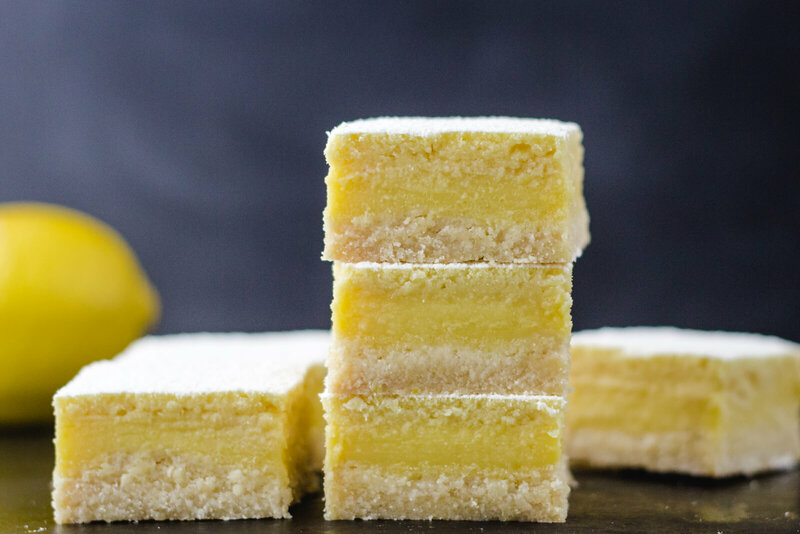 These Keto Lemon Bars are for real lemon lovers. They’re not sickly sweet or overly starchy. In this recipe, the lemon truly sings, with just the right amount of sweetness. What Makes This Sugar Free Lemon Bar Recipe Easy And Delicious? Traditional lemon bars rely on a heavy dose of sugar to counteract the acid and bitterness of the lemon juice in the lemon filling layer. So if you want them to be super lemony, that usually means using a LOT of sugar. As a result, even lemon bars made with alternative sweeteners often suffer from being insanely sweet and dull. Well made lemon curd, on the other hand, embodies everything that a lemon bar should be. Luscious, tangy, and fresh! I love making lemon curd and it’s truly very easy, but I know that not everyone has the time for that. 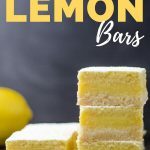 So I thought about how I could translate that exact same amazing flavor to this low carb lemon bar recipe. Why is lemon curd so darn delicious? Because it’s perfectly balanced without using quite as much sweetener to counteract the sourness of the lemon. How is that possible? Fat! The final step in making lemon curd is to whisk cold butter into the hot curd. And that added fat balances both the lemon’s sourness and bitterness. Rather than adding melted butter to the cold lemon filling mixture, I decided to use one of my all-time favorite keto baking ingredients: heavy cream powder! In this recipe, the heavy cream powder smooths out the lemon’s sourness. We can use less sweetener and bring out that delicious fresh tangy flavor that a lemon bar should have! Heavy cream powder is so convenient for keto and low carb baking because it’s shelf stable. I always keep it on hand with my other low carb flours and sweeteners! Click here to grab the exact heavy cream powder I use. Want another delicious way to use heavy cream powder? Try making my super convenient homemade Keto Hot Chocolate Mix Recipe to keep in your pantry! Are lemons OK for keto? Are lemons low carb? One lemon has approximately 5 grams of carbs, and the 3/4 Cup of lemon juice in this recipe contains 12 grams of carbs. So is lemon keto friendly? Maybe not if you were to drink that entire 3/4 Cup at once, but in this recipe it will be split into 16 servings. I baked this recipe in an 8″x8″ pan and cut it into 16 squares, so lemon juice adds less than 1 carb per bar. Not bad for such great flavor! What desserts can I eat on keto? 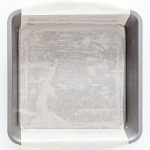 Grease an 8"x 8" baking pan and line it with a strip of parchment paper. In the bowl of a food processor, combine the coconut flour, confectioners Swerve, and salt. Press the shortbread dough firmly into the prepared pan. I like to use a second pan of the exact same size to do this but you could use the bottom of a glass or your fingers. Use a piece of plastic wrap to prevent sticking while pressing the dough in if necessary. In a medium bowl, whisk together the lemon juice, lemon zest, vanilla, whole eggs, and egg yolks. Add the confectioners Swerve, coconut flour, and heavy cream powder, sifting if yours are clumpy. Whisk to combine. For super smooth filling, I highly recommend buzzing the mixture briefly with an immersion blender (also called a stick blender). I use and love this one. Pour the lemon filling over the shortbread crust and return the pan to the oven. Bake at 325 degrees F for 30 minutes, or just until the filling has set and jiggles as one. Allow the bars to chill in refrigerator for 2 hours, or overnight. Use the parchment to pop the lemon bars out of the pan and transfer them to a cutting board. If the bars are stuck, just dip the bottom of the pan in a dish of hot water for a minute to gently warm the outermost layer of fat. The bars will slide right out of the pan! Cut the lemon bars into 16 squares and use a small mesh strainer to dust the tops with confectioners Swerve. Making these lemon bars for a party? For the neatest, cleanest cuts possible, I use a granton blade slicer. I dip the knife in a dish of hot water and quickly dry it with a paper towel before making a cut. Then repeat. 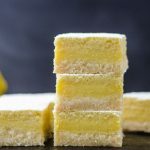 WANT TO SAVE THESE KETO LEMON BARS FOR LATER? CLICK HERE TO SAVE THIS RECIPE TO YOUR FAVORITE KETO PINTEREST BOARD!